From French designer Fabien Dumas, the shapes in the Tam Tam Collection by Marset are both systematic and sporadic, evoking comparisons of the planetary kind and beyond. With its spinning, glossy Black lacquered shades and contrasting bright light, the Marset Tam Tam 5 Central Shade draws comparisons to bright solar systems spinning in dark space. Its large central shade is the sun, around which five satellite shades orbit. And just like planets, these outer shades rotate 360 degrees for just the right configuration of light. It's a bunch of grapes, the Perseus constellation, a drum set. Whatever it may bring to mind, the Marset Tam Tam 3 Pendant clearly reinvents the standard pendant light. 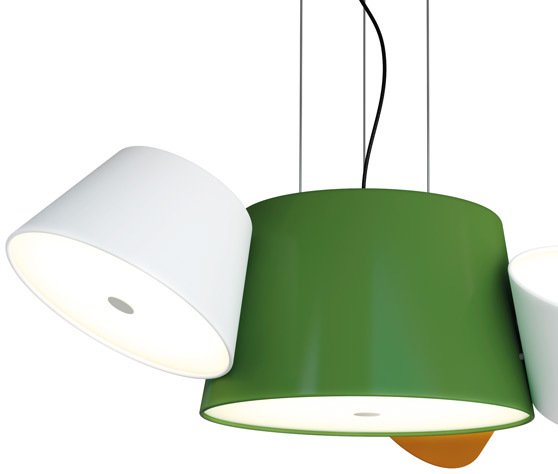 It features a large aluminum shade with three smaller shades attached to it, each in their own pickable color. These outer shades rotate 360 degrees for customized lighting effects. A cheerful little guy that's just as mighty as his big brothers. 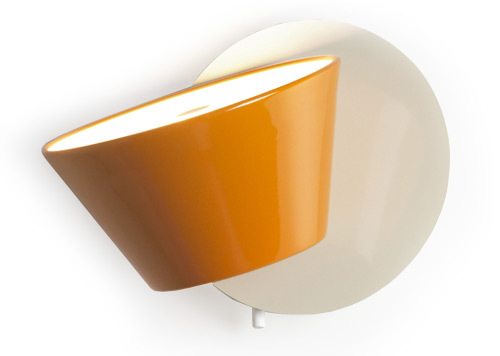 The Marset Tam Tam A Wall Sconce features a single flared aluminum shade available in a variety of glossy colors. It rotates 360 degrees and comes with an integral on/off switch, making it a particularly fun and functional fixture for bedside applications. By his eighth birthday, designer Fabien Dumas had already traversed the globe. Now based in Berlin, he applies this global sensibility to his creative and innovative lighting designs for renowned manufacturers like Marset and Ingo Maurer. Born in 1976 in Martinique, Dumas graduated from the Berlin University of Art in 2003. This playful, risk-taking designer has appeared in international publications like Case da Abitare and Elle Decor, among others. We caught up with Dumas to learn a little more about his history and approach. How did you get your first job as a designer? Ingo Maurer gave me my first opportunity, right after I graduated. I joined a very good friend of mine who had a project meeting with him in Berlin and once they were done I presented him the prototype of Light au Lait. I could see he was quite surprised, but in a pleasant way. Then he said, "Welcome aboard!" and eight months later the lamp was introduced at the Light+Building 2004 in Frankfurt. Since then, Light au Lait has sold continuously and still remains in the collection. What do you love about designing lighting? The shadows that light throws and the dance that occurs, the "light arabesque." In what ways did your upbringing in Martinique inform your approach to your work? Martinique, Tahiti, French Riviera, Germany... we had to move quite a lot during my childhood. My father was in the military, changing bases every few years. At the age of seven I already had already a world-round trip behind me. This is probably what shaped me the most, this ever-changing life, leaving good friends while always making new ones. Why have you chosen Berlin as your home? Your designs have a playful quality, while maintaining a modernist aesthetic. Where do you find creative inspiration? Which designers have influenced you the most? More than lighting designers, I would say that certain eras have influenced me. For sure the Modernist movement and the Bauhaus, but also the incredible mix of genres that Cappellini brought to the forefront. You describe the TamTam Light as "geometrically arranged to invoke a feeling of organized chaos." Could you say something more about that? Also, anything notable you could add about the inspiration and design/ manufacture process of the TamTam collection? While the overall appearance may evoke chaos, the function remains quite obvious and simple. Within a minute you understand how it works and what it can do. Let me put as a professor once explained: "Design is not about creating a fantastic guide-system for an airport. Design is about creating an airport that doesn't require any guide-system." Could you explain the name of your website: "too many designers"? What's your favorite project that you've worked on? Probably Light au Lait. You never forget your first time. Can you describe your workspace a little bit? What's your studio like? It's a pretty messy room in my apartment with tons of material, sketches and tools. I enjoy working at home even if sometimes I miss having a real workplace with heavy machines and lots of space.